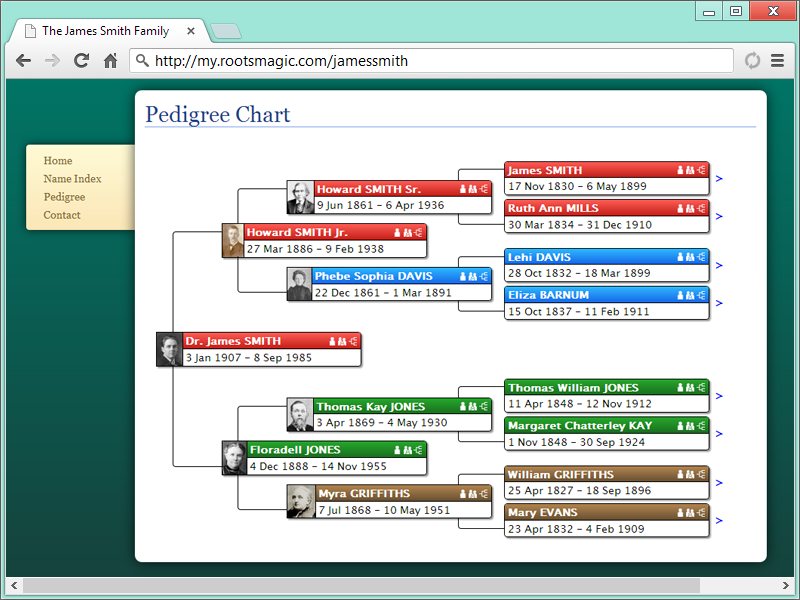 Throughout its 13-year history, RootsMagic has helped people research and share their family trees with innovative features such as moving people from one file to another with your mouse, a SourceWizard to help you document your work, creating a Shareable CD to give to family and friends, and running RootsMagic off of a USB flash drive when you are away from home. RootsMagic has also received numerous awards, including the award for “Easiest to Sync” from FamilySearch for their work in interfacing with that system. Then click through to see the actual records. Our all new accounts which let you easily publish and maintain multiple online trees. From a single screen you can easily publish, view, change settings, refresh, or delete multiple trees. Your trees can be public or private (password protected), and since your new online tree is database driven, you can change settings (like privacy settings, home page title and description, etc) for your website without having to re-upload your database again. 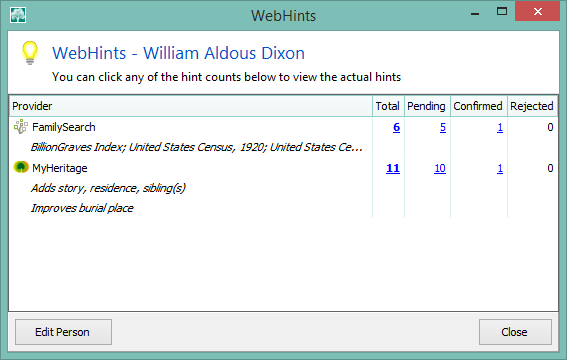 Quickly find and fix possible problems with names and places. You choose which problem types to look for, and RootsMagic will display a list of all names or places with any of those problems. 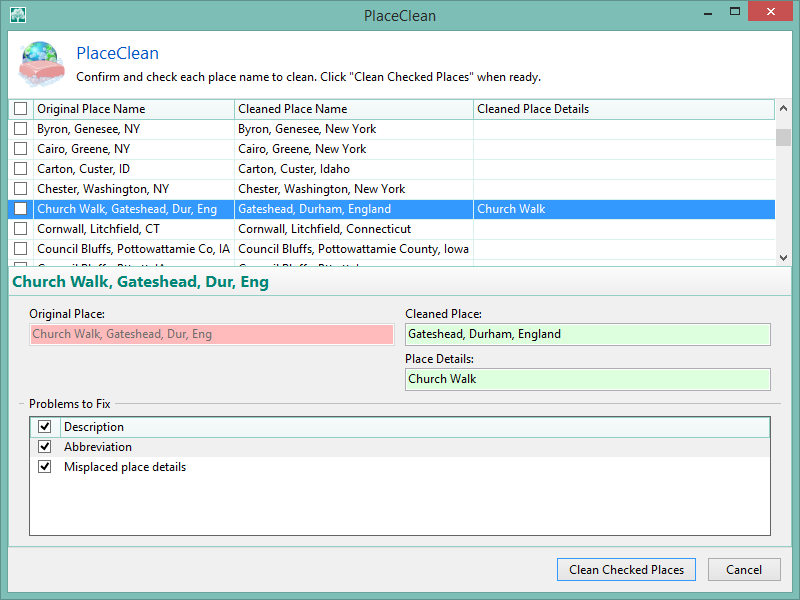 You can accept RootsMagic’s suggestions, or just part of them, or hand customize the place right from DataClean. 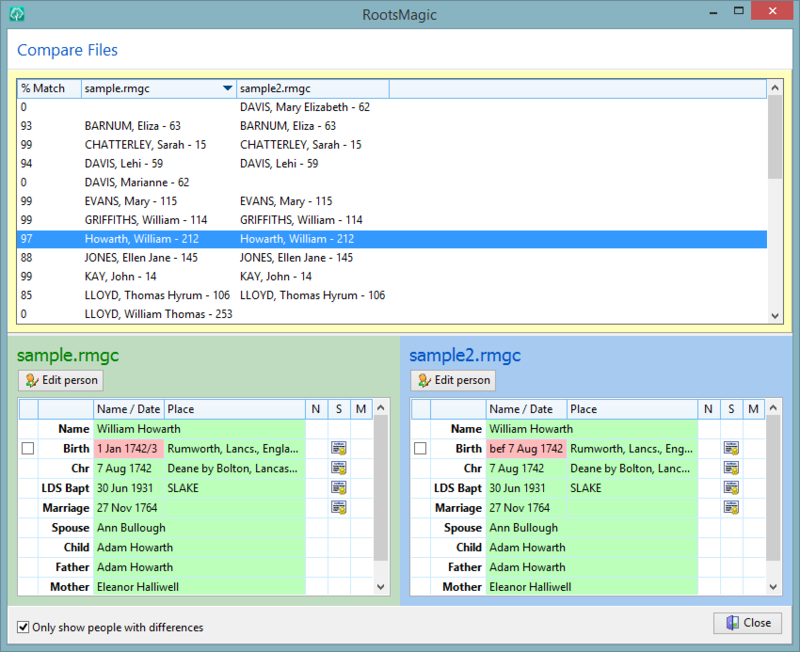 Compare any two RootsMagic databases for a side by side comparison. Easily transfer people, names, events, notes, sources, or media between the two files. RootsMagic 7 is also available in an updated, free edition named, “RootsMagic 7 Essentials”. RootsMagic Essentials contains many core features from the RootsMagic software and the two products are fully-compatible with one another. “Many people are curious about their family history and don’t know where to begin,” said Michael Booth, vice president. “RootsMagic Essentials is the perfect way for someone to get started, risk-free.” RootsMagic Essentials is available for download at http://www.rootsmagic.com/try. RootsMagic 7 is now available online at http://www.rootsmagic.com/rootsmagic or by calling 1-800-766-8762. New users may purchase RootsMagic 7 for only $29.95. Users of previous versions of RootsMagic and it’s predecessor, Family Origins may purchase RootsMagic 7 for the upgrade price of only $19.95. Marvellous… Well done Bruce and Everyone !! I want to Upgrade to new full Ver 7 now together with full new Ver 7 Book and disc asap. Reply: New users may purchase RootsMagic 7 for only $29.95. 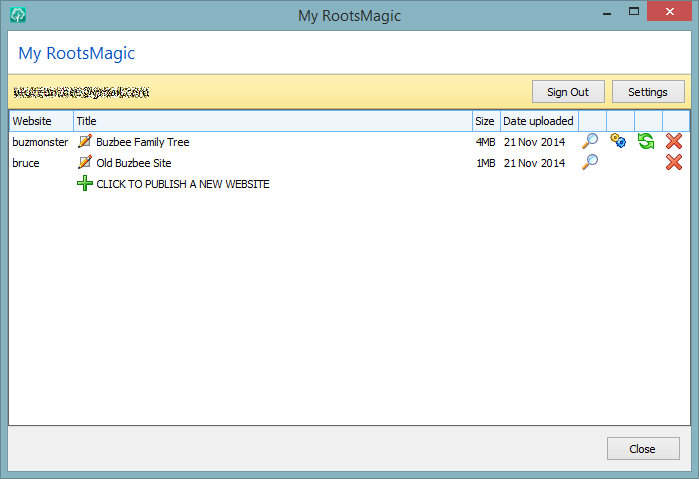 Users of previous versions of RootsMagic and it’s predecessor, Family Origins may purchase RootsMagic 7 for the upgrade price of only $19.95. The book is $10.00 right now. Where oh where is the Mac version??? Reply: The Mac version is still being worked on. The MacBridge for RootsMagic 7 is available until then. This looks like a very good upgrade of the existing RootsMagic software. 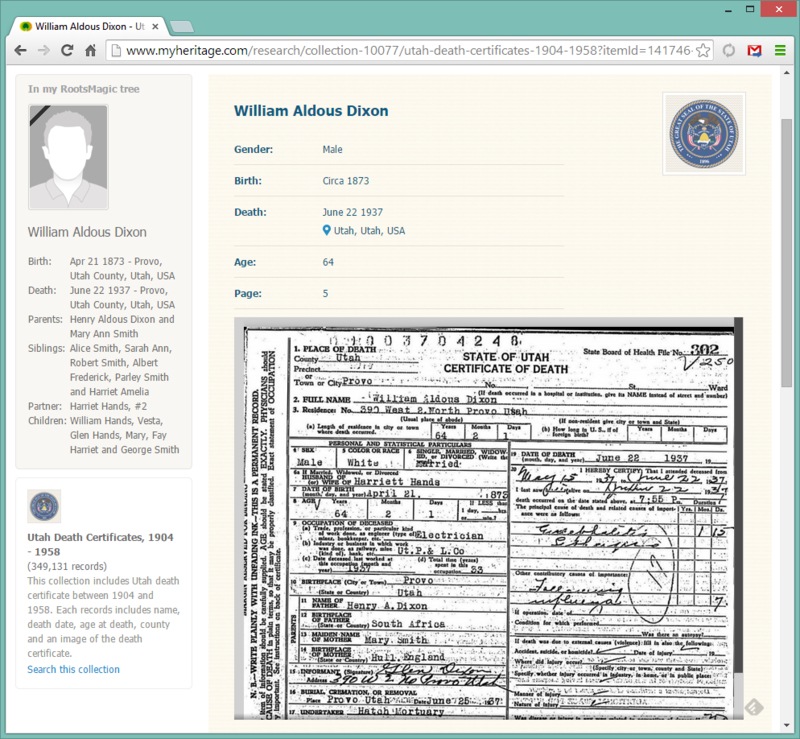 I appreciate the linkages to websites that may have FamilySearch and MyHeritage hints. One reason I don’t use Family Tree Maker is it seems every year they come out with a new edition with a higher price than the last edition. Even though after a while it is as easy to use as Roots Magic but Roots Magic has too many good point to even think of changing back. I’m with Michael and the thousands of other Mac users – where is the Mac version? MacBridge is inadequate, costs $10-15 more, and doesn’t even support all the features of RootsMagic. If you use the right development platform, porting a Windows app to Mac is not that hard. Come on, already! Reply: When we release the native Mac version we want it done right, not quick and dirty. Quality takes time. being a user of roots magic for many years I have just updated from Roots magic 6 which did the job, but now with the extras added to Roots Magic 7 it now has the much needed functions missing from previous version which now puts its back on top. “Compare files” is really nice. I will be interested to see it when I can get it on my machine. It does sound like a winner.